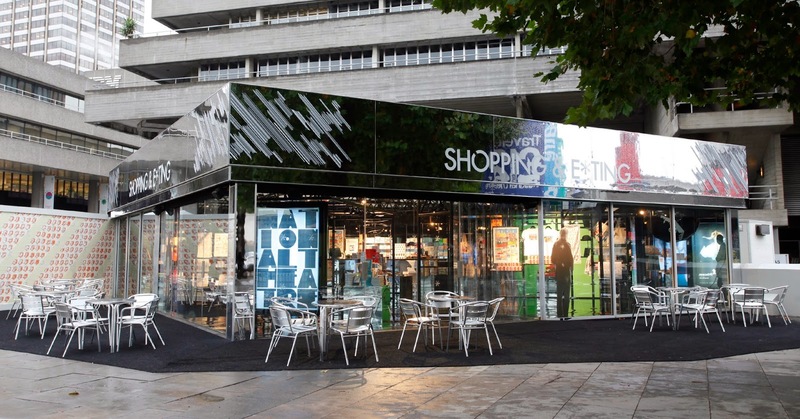 The National Theatre is celebrating it's 50th year with the launch of a new pop-up shop and cafe, on the site where The Propstore was in the summer, with a name that plays tribute to Mark Ravenhill's play Shopping and F***ing. It sounds like it's incorporating some of the cafe elements of The Propstore, albeit cooked from a Citroen Van, but also has a shop with lots of limited edition prints and so on. It's open every day from now until early January. "The latest in a series of innovations to launch on the vibrant South Bank in London [located on the site of its summer café-bar Propstore] and set against the backdrop of the National’s iconic building, Shopping and E*ting will provide a truly theatrical experience. Shopping and E*ting presents an eclectic mix of unique products and includes limited edition prints specially commissioned from the greatest in contemporary design talent from the UK. To celebrate the National Theatre’s 50th anniversary, UK-based and international product designers have been invited to showcase their work at the shop. Iconic designers Michael Craig-Martin, Jamie Reid, Paula Scher, David Carson and Graphic Thought Facility have created stunning signed, limited edition prints for each decade of the NT’s 50 years. Adam Dant celebrates the audience in a series of Hogarthian sketches of Attitudes and draws his own unique vision of how the National Theatre works. ‘Everybody Dies’, a range of witty products on Shakespeare’s Tragedies, will also launch exclusively at the shop, including greetings cards, mugs, bags, tea-towels and prints. Visitors will also experience a unique street food and drink offer curated by the National Theatre’s innovative chefs, freshly cooked in an adjacent 1950’s Citroen van, including small dishes for £5 such as goose pies, Flammkuchen or pannetone bread and butter pudding." Walk to the main entrance of the National Theatre, face the river, and Shopping & E*ting is located to your right.